Dr. Ashraf Haddad received his medical degree from the Jordan University of Science and technology. He then moved to the United Kingdom where he finished two years of basic surgical training. Then, in his pursuit for excellence, Dr. Haddad moved to the United States to complete his general surgery training at St. Agnes Hospital in Baltimore, Maryland. During his training Dr. Haddads interest in the field of Minimally Invasive and Bariatric surgery grew. He presented his research work in numerous national and international meetings. Furthermore, Dr. Haddad had numerous publications in prestigious journals in the fields of Bariatric, Gastrointestinal and Pancreatic Surgery. After completing his general surgery training, Dr. Haddad moved to California to complete his Minimally Invasive, Advanced GI, and Bariatric surgery fellowship at UCSF - Fresno under the tutelage of Dr. Kelvin Higa. 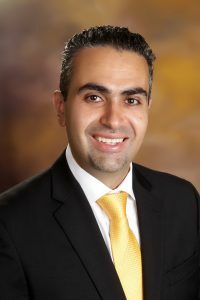 During the time he spent working with his mentor Dr. Haddad developed his passion and attained his skills for complex and revisional bariatric and gastrointestinal cases. In 2015 Dr. Haddad moved back to Amman to join his Colleagues at GBMC Jordan. Dr. Haddad wants to deliver the highest standard of care to his patients in a state of the art center.